This filter set includes four replacement filters for the 50 GPD 5-Stage Reverse Osmosis Water System RO5-50. 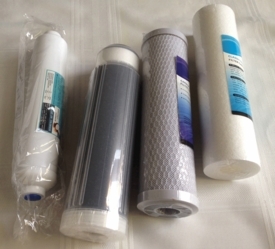 The 4-filter kit includes: 5-micron Sediment Polyspun Filter cartridge, GAC Filter Cartridge, 10-micron Carbon Block Filter Cartridge and Inline GAC filter. The four filters listed above can be changed every 6-12 months (depending on use). The kit does not include the 50 GPD RO Membrane Element, which is changed every two years.